Interpreting insurance coverage can be complex and condo insurance is no exception. There seem to be many “grey zones” and “it depends” scenarios that are left for insurance experts and legal professionals to interpret and decide upon. Yet with a little knowledge, you can and should make these important decisions with the assistance of a trusted insurance broker. Every condo association is required by law to carry a master insurance policy, which includes coverage for fire, flood, hurricane, the building’s replacement cost, some liability & more. The only exception, depending on the condo’s location, may be the requirement for mandatory flood insurance coverage. If your condo sustains damages, the association’s insurance policy will typically cover the cost to bring your unit back to its original condition (when first built) minus a deductible, which the owner is responsible for paying. The deductible is likely covered in a comprehensive HO6 policy. As an individual condo owner, you may be required to carry an HO6 insurance policy by contract, not by law. ‘By contract’ means your condo association may require you to take out an HO6 policy – most do require this. The condo association typically requires that the owner’s HO6 policy covers the deductible on the association’s master insurance policy, which for many associations is somewhere in the $5,000 to $50,000 range. Additionally, if you have a mortgage on the property, the mortgagee (lender) will almost always require the borrower to secure an HO6 policy. The lender may also have certain requirements as to what the HO6 policy coverage should include. Think of dwelling items as items that stay attached if you turn your unit upside down, such as carpets, wood flooring, drapes, cabinets, etc. If you have upgrades – maybe an expensive $100,000 Italian designer kitchen – you probably want to consider increasing the dwelling coverage. A standard policy typically has exclusions from coverage and these exclusions include but are not limited to, hurricane, flood and earthquake. Think of personal property as items that fall out if your unit is turned upside down, such as sofas, chairs, tables, TV’s, computers, fridge, clothes, dishes, etc. If you have purchased $200,000 worth of furniture, you probably want to consider increasing the personal property coverage. A standard policy typically has exclusions from coverage and these exclusions include, but are not limited to, hurricane, flood and earthquake. If your unit is damaged and is inhabitable while being repaired, HO6 insurance will pay for another rental until your condo is repaired and you are able to live in the unit again. Typical Coverage: $14,000. Default is commonly 40% of personal property coverage, but can be increased. A major purpose of personal liability coverage is to act as a layer of protection for you and covered members of your household against negligent bodily injury to a visitor in your unit (does not cover if a tenant gets injured) and negligent damage that your unit may cause to another unit. Negligent is the keyword, as opposed to doing something on purpose or you not being at fault. Typical Coverage: $500,000 to $1,000,000. If you want liability coverage off-premise – outside your unit – such as the common areas of your condo (example: gym in the condo) or away from your home (example: playing golf), then you need to make sure you add an extension of coverage to your insurance policy. Many insurance agents will add this extension by default, but it may be wise to verify that you are covered off-premise too. It is also possible to add a separate Umbrella or Excess Liability insurance policy, increasing your personal liability coverage by several million dollars. An Umbrella Policy is commonly purchased if you have other insurances (example: auto insurance) and it may cover across the various insurance policies you carry. An Excess Liability policy is commonly purchased if you don’t have other insurance policies and applies to one specific policy; in this case your HO6 policy. Small injury coverage for negligent injury to others in your unit – meant for small claims. Typical Coverage: $5,000. This amount cannot be increased. 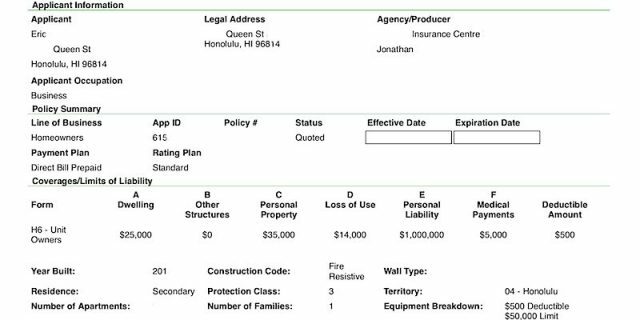 $5,000 is Hawaii’s tort threshold amount, which means medical bills have to reach $5,000 before someone is allowed to sue for personal injury. A claim above $5,000 will typically trigger your personal liability policy to kick in. Protection should the condo association assess your unit for damages. For instance, someone visits your condo building and the person slips in the lobby and sustains an injury, sues the condo association and wins a $1,800,000 settlement. If the condo association’s liability coverage is up to $1,000,000, then, for the balance of $800,000, the association may decide to assess each unit owner to pay their proportionate interest to settle instead of draining the association’s reserves. Default coverage: $5,000. This amount can typically be increased. Typically not included in a standard HO6 policy, but can be added for an extra cost. Most condo owners do not add hurricane coverage to their HO6 policy, however, this does not mean you should not include – everyone has their own risk tolerance. If a hurricane damages your condo’s windows and in turn, some of your furniture and flooring are damaged, the association’s hurricane policy may cover repairing or replacing the damaged windows. However, your personal property and dwelling coverage will likely not cover the additional damages unless hurricane coverage is specifically listed on your HO6 policy. If the damage was caused by rain after a hurricane had left your building, then, if the hurricane is still in the area or there still is a hurricane watch, it may still require you to carry hurricane insurance to be protected. However, at this point, it gets very technical and as always, any details on protection and coverage should be confirmed with an insurance professional. Not covered on a typical HO6 policy, but you can purchase coverage. On Oahu, it is extremely rare that a condo owner purchases earthquake insurance. Think of HO6 insurance, as more of a catastrophic type of insurance, and normally not an insurance someone would use to claim a few hundred dollars, which may be common practice in some countries. You can certainly file a claim for a few hundred dollars, we are not telling you otherwise, but it may increase the chance your insurance premium increases or the carrier outright denies you coverage in the future. As always, consult with an insurance specialist before making decisions. The HO6 policy typically has a $500 deductible. The deductible amount can typically be increased or decreased – $0 to $2,000 range is most common. Who is Responsible For Paying for Damages? It often depends as there are endless numbers of possible scenarios and unfortunately, there are no clear cut answers in many cases, so it is left for the insurance companies to work settlement matters out. If a unit has expensive furniture damage due to a water leak from a unit above, who is responsible for paying to replace the furniture? The association’s policy will only cover costs to bring a unit back to its original condition when built, so someone else will have to pay to replace that expensive furniture. Hopefully, the owner with the damaged furniture had sufficient personal property insurance coverage included in their HO6 policy that covers the personal property loss. Will their insurance company try to get money from the insurance company covering the condo where the leak came from? Possibly, and may depend on the cause of the water leak. What if the owner of the unit where the water leak came from has a liability coverage that is less than the cost of the damaged furniture? I don’t know and it is a rather extreme scenario, as most owners will have an HO6 policy with at least $500,000 in liability coverage, but nonetheless interesting to consider. Step 1: Mitigate any further loss & damage. Example: If water keeps running and you can’t stop it, call security in your building, a plumber, a handyman, a contractor or other subject matter expert to help stop the water from running and mitigate any other matters that require immediate attention. Step 2: Take several photos, which show the damage and also note time of damage (photos taken with a smartphone are normally time stamped). Step 3: Contact your insurance agent and the agent will advise you what steps to take next. The agent can normally introduce water restoration companies and other subject matter experts as needed. In an ideal world, you should contact your insurance agent before hiring contractors, plumbers etc. However, as described in Step 1, mitigating damages is the top priority. The insurance agent will initiate the claims process and put you in touch with an adjuster working at the insurance firm who will come to your unit, review the damage, take photos and oftentimes give you an idea as to the amount you can expect to be compensated. If applicable, an adjuster from the insurance company covering the party where the issue came from will also inspect the damages and the adjusters will work out a settlement between the two insurance companies. Condo living – just like life itself – comes with risk and each one of us have to determine our risk vs cost tolerance. Water damage is by far the most common reason for a claim, but personal liability is likely the one feared the most. Is a $500,000 personal liability insurance policy sufficient or would $10,000,000 be more comforting, despite the increased cost? Irrespective of your risk vs cost tolerance and your condo association’s policy, we encourage you to carry an HO6 insurance policy.